This article is about Boise, Idaho. For the airport serving Boise City, Oklahoma, see Boise City Airport. 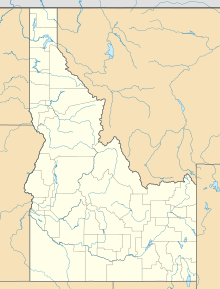 Boise Airport (IATA: BOI, ICAO: KBOI, FAA LID: BOI) (Boise Air Terminal or Gowen Field) is a joint civil-military airport three miles south of Boise in Ada County, Idaho, United States. The airport is operated by the city of Boise Department of Aviation and is overseen by an Airport Commission. It is by far the busiest airport in the state of Idaho, serving more passengers than all other Idaho airports combined and roughly ten times as many passengers as Idaho's second busiest airport, Idaho Falls Regional Airport. Boise is a landing rights airfield requiring international general aviation flights to receive permission from a Customs and Border Protection officer before landing. In addition to being a commercial and general aviation airport, Boise also functions concurrently as a USAF military facility as used by the 124th Fighter Wing (124 FW) of the Idaho Air National Guard on the Gowen Field Air National Guard Base portion of the airport. The 124 FW operates the A-10 Thunderbolt II aircraft. The National Interagency Fire Center (NIFC) is based in the city of Boise and the Boise Airport is used for logistical support. The United States Forest Service (USFS) also uses Boise Airport as a base for aerial firefighting air tankers during the wildfire season. Boise Airport had 1,487,764 enplaned passengers in 2015, growing from 1,378,352 passengers in 2014, for a total of 7.94% annual growth. BOI ranked 72nd in the nation in enplanements for 2015. Boise's first municipal airport, Booth Field, was built in 1926 on a gravel bed near the south bank of the Boise River, now the campus of Boise State University. The first commercial airmail flight in the United States passed through this airfield on April 26, 1926, carried by Varney Airlines. Varney began operating out of Boise in 1933, later merging with National Air Transport to become United Airlines. Since United traces its roots to Varney, United is recognized as the airline that has operated the longest out of Boise, 93 years as of 2019. United has contracted out its airport operation to SkyWest Airlines and no longer has any active employees in the state of Idaho, although as of May 2016 United Airlines operates two daily mainline flights between Boise and Denver (DEN). Less than four months after his historic transatlantic flight, the airfield hosted Charles Lindbergh and the Spirit of St. Louis on September 4, 1927. The current airport has its origins in 1936 when Boise began buying and leasing land for the airport. By 1938, Boise had the longest runway in the United States at 8,800 feet (2,680 m), built as a Works Progress Administration (WPA) project under sponsorship of the city. The steel hangar for Varney Airlines was moved to the present field in 1939. As aircraft grew the hangar was no longer big enough and was converted into a passenger terminal. It was part of the modern terminal facility until the completion of a new terminal in 2004. During World War II, the U.S. Army Air Forces leased the field for use as a training base for B-17 Flying Fortress and B-24 Liberator bomber crews. More than six thousand men were stationed there during the war. The field was named Gowen Field in 1941 on July 23, after 1st Lt Paul R. Gowen (1909–1938). Born and raised in Caldwell, he attended the University of Idaho for two years, then obtained an appointment to West Point in 1929, and graduated ninth in his class in 1933. While piloting a twin-engine B-10 bomber in the Army Air Corps, Gowen was killed instantly in a crash in Panama in July 1938. The right engine failed shortly after take-off from Albrook Field, near Panama City. The other two crew members, navigator and radio operator, survived and crawled from the wreckage with burns. After the war the part of the field used by the Army Air Forces was returned to the city. The Idaho Air National Guard began leasing the airfield after the war and continues to do so at the present time. The jet age arrived in Boise during the mid 1960s. In 1966, United Airlines was operating Boeing 727-100 jetliners into the airport with round trip routings of Boise (BOI)-Salt Lake City (SLC)-Chicago (O'Hare, ORD)-Boston (BOS) and Seattle (SEA)-Portland (PDX)-Boise (BOI)-Salt Lake City (SLC)-Denver (Stapleton, DEN)-Chicago (ORD)-New York (Newark, EWR). United was also serving the airport with Douglas DC-6 and DC-6B propliners at this time. West Coast Airlines introduced Douglas DC-9-10 jet service during the late 1960s and in 1968 was operating round trip routings of Seattle (Boeing Field, BFI)-Portland (PDX)-Boise (BOI)-Salt Lake City (SLC) and Portland (PDX)-Seattle (BFI)-Boise (BOI)-Salt Lake City (SLC) with the DC-9. West Coast was also serving Boise with Fairchild F-27 turboprops and Douglas DC-3 prop aircraft in 1968. The same year West Coast merged with Bonanza Air Lines and Pacific Air Lines to form Air West which was subsequently renamed Hughes Airwest which in turn continued to serve Boise with Douglas DC-9 (-10, -30) jets. In 1972, Hughes Airwest was operating nonstop DC-9 service from Boise to Portland and Salt Lake City and was also flying direct (no change of plane) DC-9 service to Los Angeles (LAX), Las Vegas (LAS), Phoenix (PHX), San Diego (SAN), Burbank (BUR), Santa Ana (SNA), Spokane (GEG) and other regional destinations. By 1976, Hughes Airwest and United were still the only two airlines operating jet service into Boise according to the Official Airline Guide (OAG). United had also expanded its Boise service by this time and was operating nonstop flights with Boeing 727 (-100, -200) and larger Douglas DC-8 jetliners to Chicago (O'Hare), Denver (Stapleton), Portland, Salt Lake City, San Francisco, Seattle, Reno, and Spokane as well as direct, no change of plane jet service to New York (LaGuardia), Los Angeles, Boston, Washington, D.C (National), San Diego, and Hartford, according to the Official Airline Guide (OAG). United and Hughes Airwest were operating all of their flights into Boise with jet aircraft at this time. Between 2001 and 2005, Boise Airport was remodeled with a new terminal and an elevated roadway for departures, constructed in two phases. Phase 1 considered amenities such as baggage claim, lobby, and food and beverage concession, which were completed in 2003. Phase 2 dealt with security checkpoints and a new concourse (Concourse C) and the remodeling of Concourse B, which were completed in 2005. The Boise Airport Passenger Terminal designed by CSHQA is a three-story, steel-framed 378,000-square-foot (35,100 m2) state-of-the-art aviation facility. Curvilinear, steel trusses create the undulating ceiling plane of the ticket lobby and define the signature profile of the building. The terminal has garnered national attention for the beauty of its design and is considered a prototypical post-9/11 facility. The Boise Airport was fourth in passenger satisfaction in the J.D. Power and Associates 2004 Global Airport Satisfaction Index Study. Power no longer publishes a global listing, and the airport was not listed in the 2017 North American ranking. The Boise Airport was a hub for Horizon Air from the late 1980s to the early 2000s. Horizon Air was acquired by the Alaska Air Group, the parent company of Alaska Airlines, in 1986 and began code sharing flights for Alaska Airlines at that time. During the summer of 1990, Horizon Air was operating up to 36 departures a day from the airport to destinations in Idaho, Oregon and Washington as well as direct one stop service to Salt Lake City. By 1999, Horizon Air was operating up to 22 departures a day from Boise with Fokker F28 Fellowship jets with additional flights being operated with de Havilland Canada DHC-8 Dash 8 turboprops. The regional airline also previously operated Dornier 328, Fairchild F-27 and Swearingen Metroliner propjets. Boise is currently a focus city for Alaska Airlines service operated by both Horizon Air and code sharing partner SkyWest Airlines. In the year ending December 31, 2017 the airport had 124,917 aircraft operations, average 342per day: 46% general aviation, 38% airline, 7% air taxi, and 9% military. 264 aircraft were then based at this airport: 53% single-engine, 11% multi-engine, 14% jet, 6% helicopter and 16% military. Of the top 100 United States airports, BOI is among four airports that does not charge a PFC. The airport can handle minor maintenance and repairs through fixed-base operators Jackson Jet Center, Turbo Air and Western Aircraft. Law enforcement is handled by the Boise Police Department. In 2006, the Airport Division had an authorized strength of 1 lieutenant, 2 sergeants, and 28 officers, and there were five TSA certified K-9 units trained in explosive detection. The original layout was the primary runway (10R/28L) with two others at 6,000 feet (1,830 m), both are retired but still visible as taxiways. The north–south runway (offset slightly northeast) was aligned with present-day S. Zeppelin Street (approximately with Owyhee Street to the north), and the east–west runway was offset slightly southwest. The intersection point of the two former runways was on today's main taxiway, near the terminal. The second parallel runway (10L/28R) was extended 2,300 feet (700 m) to the east in 1998. The new air traffic control tower under construction in 2009. In 2008, city officials broke ground for Boise Air Terminal's a new airport traffic control tower, the latest facilities improvement. The tower's height at 295 feet (90 m) made it the tallest building in the state of Idaho until it was surpassed by the Zions Bank Idaho Headquarters Building in 2013 (at 323 ft (98 m)), and the Northwest's tallest control tower. It was relocated to the south side of the airport in order to control an existing Guard assault strip, runway 09/27, south of Gowen Field. The tower was planned and constructed when it was believed that the radar functions would be moved to Salt Lake City in Utah. After it was decided to leave the radar positions in Boise, the facility at the base of the tower was redesigned and partially remodeled to house the Terminal Radar Approach Control (TRACON). The tower and TRACON opened on September 16, 2013 with updated electronics and equipment, including the STARS radar system; improving services and safety for pilots and the flying public. With the expanded facilities and new equipment, the TRACON operates the approach control for Boise Airport, and also remotely operates the approach control for the Bozeman Airport in Montana. The TRACON was then renamed Big Sky Approach to reflect the broader geographical coverage. The consolidation of Boise and Bozeman approach control facilities into Big Sky Approach is part of the FAA's continuing plan to consolidate approach control services across the nation. Boise's TRACON was designed with the option of adding additional radar scopes, and may offer approach control services to other airports in the future. 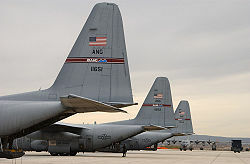 C-130s previously operated by the Idaho ANG parked on the ramp at Gowen Field. 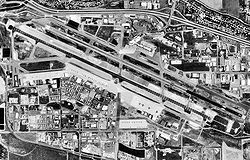 Gowen Field Air National Guard Base primarily refers to the military facilities on the south side of the runways, which includes Air National Guard, Army National Guard, and reserve units of the Army, Navy, and Marine Corps. The field is home to the 124th Fighter Wing (124 FW), Idaho Air National Guard, which consists of one flying squadron operationally-gained by the Air Combat Command (ACC) and 12 additional support units. The aircraft based at Gowen Field ANGB is the A-10 Thunderbolt II close air support attack aircraft of the 190th Fighter Squadron (190 FS). The 124 FW was previously designated as the 124th Wing (124 WG), a composite Air Combat Command (ACC) and Air Mobility Command (AMC) unit that also operated C-130H Hercules transport aircraft in the 189th Airlift Squadron (189 AS), the 189 AS being operationally-gained by AMC. BRAC 2005 directed that the Idaho Air National Guard divest itself of the C-130 mission by 2009, transferring its C-130s to the Wyoming Air National Guard, while retaining its A-10 fighter mission. This action was completed in 2009 and the 124 WG was redesignated the 124 FW at that time. The 124 FW is composed of over 1000 military personnel, consisting of just over 300 full-time Active Guard and Reserve (AGR) and Air Reserve Technician (ART) personnel and over 700 traditional part-time Air National Guardsmen. In February 2011, FedEx donated a surplus Boeing 727-200 cargo jet (tail number N275FE) to the City of Boise for use as a training tool for emergency first responders. The aircraft—stripped of engines—is parked near the southeastern end of Boise's third runway—a location more than a mile southeast of, and not visible from, the main passenger terminal. Several agencies use the plane for training purposes. On December 9, 1996, Douglas C-47A N75142 of Emery Worldwide crashed on approach, killing the only two crew members on board. The aircraft was on a cargo flight to Salt Lake City after sunset when the starboard engine caught fire shortly after take-off and the decision was made to return to Boise. On February 3, 2012, a Lancair IV-PT turboprop (N321LC) flown by Steve Appleton, CEO of Micron Technology, crashed shortly after take-off from runway 10R, killing the pilot. Attempting an emergency landing, Appleton had aborted an earlier take-off attempt for unknown reasons; the accident was attributed to pilot error. ^ "Statistics - City of Boise". www.iflyboise.com. ^ "FAQs". Boise Airport. City of Boise. 2005. Retrieved August 31, 2006. ^ a b c d Boise Airport (2005). "Airport Administration". City of Boise. Retrieved August 31, 2006. ^ a b "Gowen Field Air National Guard Base". GlobalSecurity.org. January 21, 2006. Retrieved August 31, 2006. ^ "Lindbergh reaches Boise". Spokesman-Review. (Spokane, Washington). Associated Press. September 5, 1927. p. 1. ^ "Lindbergh hops off". Eugene Guard. (Oregon). Associated Press. September 5, 1927. p. 1. ^ a b "Boise's new 960-acre municipal airport as seen from the air". Lewiston Morning Tribune. (Idaho). (photo). October 29, 1939. p. 4. ^ "Paul R. Gowen". Find a Grave. Retrieved May 23, 2014. ^ a b c "Lt. Paul R. Gowen" (PDF). Idaho Military Historical Society: Pass in Review. September 2003. pp. 5, 6. ^ "Beta Theta Pi". Gem of the Mountains. University of Idaho. 1928. p. 365. Retrieved August 28, 2012. ^ "Whence Came the Name . . . ?". Gowen Research Foundation Electronic Newsletter. 1 (7). July 1998. Archived from the original on September 27, 2007. Retrieved August 31, 2006. ^ "Obituary: Lt. Paul Gowen (1909–1939)". rootsweb.ancestry.com. Retrieved August 28, 2012. ^ "History of BOI". City of Boise. Retrieved May 23, 2013. ^ CSHQA Architecture, Engineering, Planning, Boise Idaho Archived April 22, 2008, at the Wayback Machine. Cshqa.com. ^ "2004 Global Airport Satisfaction Index Study" (PDF). J.D. Power and Associates. December 6, 2004. Retrieved August 31, 2006. ^ "Airport satisfaction survey 2017" (PDF). www.jdpower.com. ^ FAA and Airport Operations. Iflyboise.com. ^ "Airport Police". Boise Airport. City of Boise. 2005. Archived from the original on March 6, 2009. Retrieved August 31, 2006. ^ "Aviation Capacity Enhancement Plan" (PDF). Federal Aviation Administration. 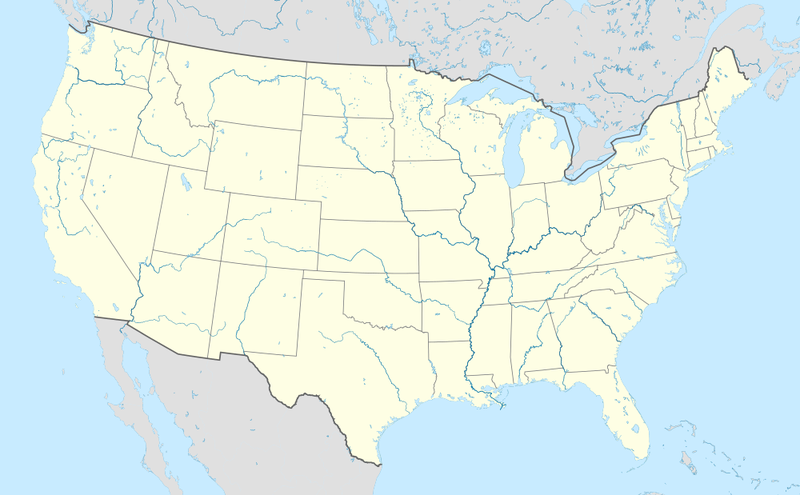 (U.S. Department of Transportation). 1995. p. D-5 (appendix). ^ 124th Wing [124th WG]. Globalsecurity.org (December 31, 1952). ^ Zumbach, Lauren. "American adds routes to Wisconsin, Guatemala, Spain at O'Hare". ^ "Flight Schedules". American Airlines. American Airlines. Retrieved 4 July 2017. ^ 2018, UBM (UK) Ltd. "Frontier Airlines outlines launch date for new routes in S18". ^ "Southwest Airlines Publishes Summer 2018 Flight Schedule". Southwest Airlines retrieved November 15, 2017. ^ RITA | BTS | Transtats. Transtats.bts.gov. ^ "N75142 Accident description". Aviation Safety Network. Retrieved June 25, 2010. ^ "Two die when freight plane crashes at Boise". Lewiston Morning Tribune. (Idaho). Associated Press. December 10, 1996. p. 7A. ^ "Plane crash in Boise kills pilot, co-pilot". Deseret News. (Salt Lake City, Utah). Associated Press. December 10, 1996. p. 14A. ^ Steve Appleton, CEO of Micron, dies in airplane crash at Boise Airport, IdahoStatesman.com, February 3, 2012. ^ Micron CEO Steve Appleton's final flight lasted 80 seconds, Idaho Statesman, February 4, 2012. ^ Hagadone, Zach (September 10, 2014). "Pilot error to blame in 2012 plane crash that killed Micron CEO Steve Appleton". Boise Weekly. (Idaho). Retrieved February 14, 2018. This page was last edited on 13 April 2019, at 22:25 (UTC).